100g organic, dairy free, milk alternative chocolate bar with organic cranberries and hazelnuts. The organic cranberries are soaked in apple juice giving them a sweet taste and a moist texture and make a perfect companion to the crunchy hazelnuts. This chocolate bar will deliver a dairy free treat that tastes just like real chocolate. Cocoa* [36%] (cocoa butter, cocoa mass), sugar* [28%], rice powder* [16%], cranberries (cranberries, apple juice, sunflower oil) and Hazelnuts* [20%], emulsifier (sunflower lecithin) & natural flavouring. 90% of the agricultural ingredients are produced in accordance with the rules of organic production. The Moo Free Dairy Free Cranberry & Hazelnut Chocolate Bar - 100g product ethics are indicated below. To learn more about these product ethics and to see related products, follow the links below. Tastes really good. I’m not dairy intolerant but do Vegan weeks every now and then and these are one of my go to chocolate bars! Yummy!rnMy son loves them too, who is intolerant to casein. Bought as a gift for a Vegan - very well received! There are currently no questions to display about Moo Free Dairy Free Cranberry & Hazelnut Chocolate Bar - 100g. 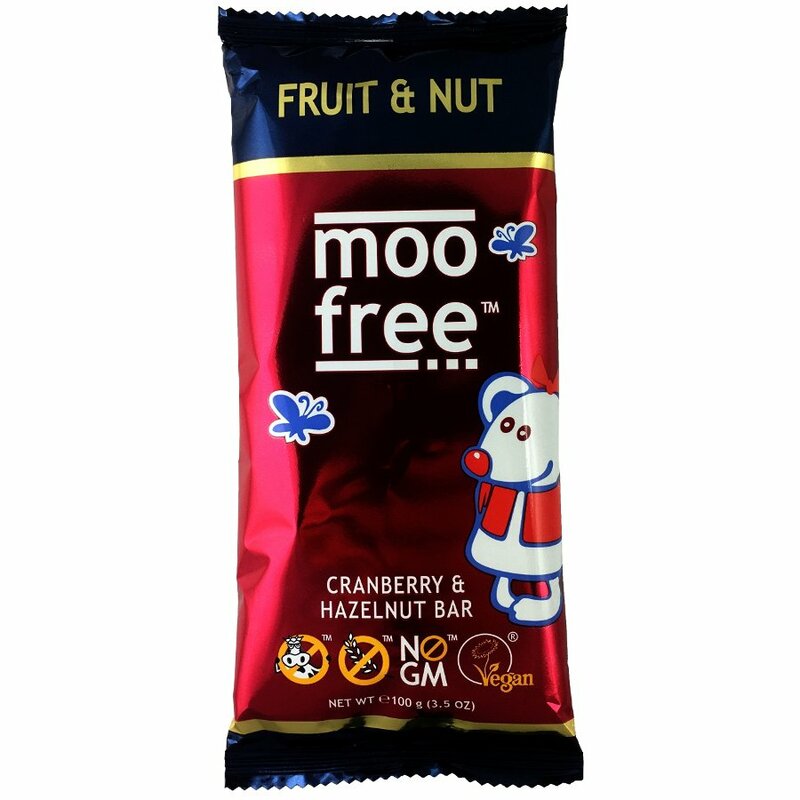 Moo Free is a manufacturer of quality dairy free, lactose free and Vegan chocolates. Made to their own special secret recipe ensuring anyone can enjoy the taste of delicious milk chocolate without the milk. Made in a special dairy free clean room Moo Free chocolate is organic and made with fair trade cocoa.